About Art-O-Mat | Queens 'O Scream! Art-O-Mat is the brainchild of Clark Whittington, who envisioned repurposing cigarette machines to dispense small packets of art. 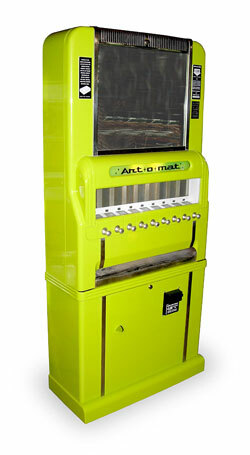 The Art-O-Mat website is http://www.artomat.org/, where you can see locations and pictures of over 80 machines across the United States. Yes, i really love Buckety more, but Greeny is so photogenic!